Britain may not have invented the motor car, but it has bequeathed the motorist some of the most famous brands in motoring history. Where would the luxury car market be if the historic meeting between Charles Rolls and Henry Royce had not happened at the Midland Hotel, Manchester on May 4, 1904? Could England have swung quite like a “pendulum do” if Alec Issigonis had put not pen to drawing board and designed the Mini? Would the Bentley Boys have enjoyed four consecutive victories at the Le Mans 24 hours from 1927 to 1930 in any other make? Other brands—Jaguar, Aston Martin, Lotus, Riley, Rover, Jenson, Wolesley—have continued this engineering and design brilliance into the 21st century. However modern the British motor car industry is today, the past has not been overlooked with a range of motoring museums absolutely bursting with artifacts, objects and cars from the golden age of British driving to the present day. From the historic Brooklands Museum just southwest of London to the Beaulieu National Motor Museum in the heart of the New Forest and the Heritage Motor Centre at Gaydon near Coventry, the heart of the British motor industry, fans of British motor cars are spoiled for choice when it comes to great days out. Not many museums offer visitors a chance to return free of charge if they run out of time to see the whole in one full day—and there is plenty to see at Beaulieu. The unconventional Lord Montagu of Beaulieu began what became the National Motor Museum in 1951; his son, Lord Montagu, is still in charge. With more than 250 vehicles, the museum in the New Forest National Park tells the story of motoring on British roads and racetracks. Whatever the future might hold for the museum’s Top Gear exhibition, visitors can experience the Victorian splendor of Palace House where costumed guides give a flavor of life “below stairs.” The grounds and gardens entice visitors into the tranquil ruins of medieval Beaulieu Abbey. A monorail gives sweeping views of the park and rides through the museum pavilion itself. You can uncover the covert role played by Beaulieu during World War II in the Secret Army Exhibition. An inclusive ticket provides all the attractions: the National Motor Museum, World of Top Gear, Palace House and Gardens, Beaulieu Abbey, rides on the monorail and veteran bus and more. Located within the New Forest National Park, Beaulieu lies in easy reach of Bournemouth, Southampton and Winchester. Star cars to look out for: The actual Ford Anglia 105E “Flying Car” once owned by Arthur Weasley. It used to be a standard Ford Anglia until Weasley enchanted it, making it able to fly, become invisible to Muggles and carry his entire family despite its modest size; Mr. Bean’s Mini once belonged to the hapless Mr. Bean, played by Rowan Atkinson, in the character’s third series. The Die Another Day Jaguar XKR driven by the villain Zao is equipped with a rear-mounted Gatling gun, front and side missile launchers and a trunk full of mortar bombs. Opening Times: Open daily from 10 a.m.; Allow four to five hours, but most visitors stay longer. If you cannot stay for the whole day, or run out of time you can visit again within six days of your initial visit for free. Ask for a special pass. Children £9; Under 5s Free. Britain never had a city associated with the motor car such as Detroit; instead, it had a region, the West Midlands. That prompted the1993 opening of the Heritage Motor Centre at Gaydon, near Coventry. Its purpose is to showcase all of Britain’s motor industry. Some 300 cars are in the collection; from smaller manufacturers such as Morgan, via niche producers such as Land Rover, to the former mainstream producers such as Austin and Morris. 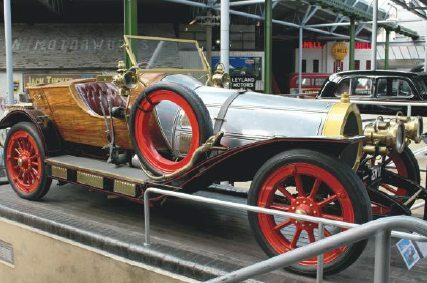 Ford came to Britain in 1909, giving it every right to be in a national collection, as well as Jaguar and Vauxhall, who bring some of their historic vehicles to the museum for visitors to enjoy. Star car to look out for: The Rover BRM gas turbine which is celebrating 50 years since it raced at Le Man with Jackie Stewart and Graham Hill. Opening Times: Open daily 10 a.m. –5 p.m. If there is one name that resonates with British motor racing enthusiasts it has to be Brooklands—the world’s first purposebuilt motor racing circuit, opened at Weybridge, Surrey in 1907. In the Campbell Shed you can discover the history of the Brooklands Circuit, and see some of the legendary cars that raced here. The Grand Prix Exhibition features F1 cars driven by racing heroes such as Senna and Hakinnen. There are also a variety of historic aircraft associated with Brooklands on display—including a World War II Wellington bomber and the only Concorde open to the public in southern England. A wide range of special events, mainly on weekends and during school holidays, are staged at the museum. Opening Times: Open daily: 10 a.m. – 4 p.m.
Children £6; Under 5s Free. Almost half a century of collecting motoring artifacts is celebrated in a beautiful riverside setting close to the southern tip of Lake Windermere. The Lakeland Motor Museum offers an eclectic road transport collection of some 30,000 exhibits covering a century of motor history. It claims Britain’s largest motoring memorabilia collection: gas pumps, globes, clothing, enamel advertising signs, pedal cars, badges, mascots, garage equipment, die-cast scale models, motor oil containers, games and glassware. If the collection is not enough of an attraction, the museum nestles at Backbarrow in the gorgeous Leven Valley, near the southern tip of Windermere. Star car to look out for: 1937 Bentley owned by Donald Campbell. Opening Times: Open daily 9:30 a.m. - 4:30 p.m.
Children £5; Under 5s Free. Grand Prix may not have the wider cachet of F1 racing, but this museum is doing its part in showcasing Grand Prix racing cars in the world. There are four halls, with more than 130 exhibits. For Formula 1 fans, there are cars driven by such famous names as Nuvolari, Mansell, Prost, Moss, Fangio and our own Jackie Stewart. The Donington Collection also houses the largest collection of McLaren and Williams racing cars in the world. Star cars to look out for: Ayrton Senna’s 1993 European Grand Prix winning car; Damon Hill’s 1996 Championship winning car. Opening Times: Open daily 10 a.m. – 5 p.m. In a country long acknowledged for its love of eccentricity, what could be more eccentric than a 1950s 3-wheeled car? What is more eccentric is that they were often built in a German factory that just a decade earlier had been turning out aircraft to pulverize British cities. Bubblecars made by Messerschmitt and Heinkel that zipped about Britain’s roads for two decades had one key weakness—a forward opening door meant if parked too closely to an obstruction the driver was trapped. Lacking a reverse gear, you could be in for a long wait. After two decades of stylishly swishing about a recovering post-war Britain, their end came with the design of the equally tiny and charming iconic Mini. Here in Boston, Lincolnshire, more than 50 microcars gather, with a row of recreated shops, memorabilia, gift shop and a lovely cafe for afternoon tea. Opening Times: Open Friday, Saturday, Sunday and Bank Holidays in the summer season. 10 a.m. – 4 p.m.
Tickets: Adults £3; Children £1. For generations, British motor enthusiasts wanting to tinker with own cars would turn to a Haynes manual. Pages of these hard-cover books have been flipped as drivers have taken out spark plugs or removed a muffler, before stopping for a cup of tea. The Haynes museum near Yeovil is the perfect monument to those nameless thousands that gave up Sundays to work on the car in the drive. One element of the museum’s drive to restore, retain and preserve items of historical motoring is that nearly every car in the museum is driven at least once a year to maintain them in full working order. There are some 400 cars and bikes on display, dating back to 1885. Familiar names include Austin, MG and Morris. For lovers of performance cars the collection includes modern classics such as the Dodge Viper and XJ220, AC Cobra and Jaguar E Type. Tickets: Adults £13.95; Seniors/Student £11.95; Children £8.25; Under 4s Free. If ever a museum was a direct refection of its founder, then the eccentric London Motor Museum is it. Now actually a recognized paean to British motoring, it is home to a unique collection of privately-owned American and European classic cars ranging from the 1930s through to the present day. The collection was built by fashion designer Elo—a regular on the Gumball rally scene. In 1999, he drove with Gumball founder Maximillion Cooper in the first rally, alongside celebrity drivers Billy Zane, Jason Priestly and Danni Minogue. Star cars to look out for: The 1966 Batmobile that featured in the TV series starring Adam West, and the 1989 version that features in Tim Burton’s gothic classic starring Michael Keaton. Opening Times: Open daily 10 a.m. – 6 p.m.